JOY MANGANO HAULED THE MOPS OUT AGAIN – TO GREAT SUCCESS! Home Shopping Network mogul Joy Mangano is enjoying even more success since director David O Russell’s movie Joy, based on her life story, was released. (Jennifer Lawrence plays Joy in the film) Joy relaunched her invention The Miracle Mop this month and according to The Hollywood Reporter she had a special customer call in. David O Russell ordered 13 mops (his lucky number) and some other products from the delighted Joy. He also told her that Bradley Cooper’s mom Gloria was a special consultant on the movie because she was an ardent fan of HSN in the 90’s! WE can’t help but wonder what Joy’s relatives think of their zany portrayals in the movie! Jennifer Lawrence and Chris Martin decided to go public with their resumed relationship by having dinner together at Madeo. Our spy noted that they looked very playful and friendly during the meal. After they ate, the waiter brought the dessert tray with a flourish. Chris was about to say no thanks, but Jennifer eyed the luscious pastries and insisted “We HAVE to pick one to share!” Martin is accustomed to his estranged wife Gwyneth Paltrow FORBIDDING dessert, but he gamely selected a slice of millefiori multi layer Italian cake. And he seemed to enjoy every bite as much as Jennifer did. Yum. Jennifer Lawrence was calmly signing autographs and greeting fans outside the Letterman show when the rowdy crowd got so worked up they knocked over the barrier with a loud crash. Her bodyguard didn’t waste a millisecond- he grabbed Jen and spun her around and without letting go, he carefully guided her to safety. Ah, the perils of being famous. Nobody was trampled. Chris Martin’s budding romance with Jennifer Lawrence heated up today when they arrived in Los Angeles in a private jet together. They came from Las Vegas where Chris performed at the iHeart Radio Festival and seemed to be singing directly to her, in the audience. They were seen looking very friendly, disembarking at Van Nuys airport. Jennifer, 24, and Chris, 37, have been cozying up in both New York and Los Angeles of late, but avoid being photographed together. According to a friend, Jennifer was mesmerized when she saw Coldplay perform in the UK in June, and now she’s dating her crush! 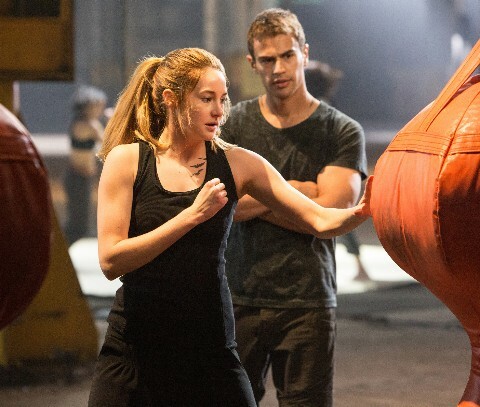 Is anybody else out there sick to death of hearing about and seeing Shailene Woodley everywhere you turn? For weeks before Divergent was released, Shailene (whom at first we assumed was some country singer) appeared on every talk show, morning, noon, and night, and she was introduced with Angelina Jolie fanfare before anyone knew who she was. Of course she was also plastered all over magazines, newspapers, and websites. And she was literally unknown. We wondered why she was being shoved down our throats so relentlessly. To make us aware of Divergent, of course. The movie opened to a healthy 56 million box-office, but it was far behind The Hunger Games’ 152.5 million. Shailene seems like a nice girl, but she’s no Jennifer Lawrence. It wasn’t HER fault, but people were turned off by Shailene’s over-exposure – hopefully it won’t dent her career.